Join Research Triangle Fencing & Duke University coaching staff – coaches of the 2018 ACC Champions – for a special summer fencing camp. Whether you’re looking to achieve peak condition before Summer Nationals, prepare for your next tournament, or just learn to train like us, this five-day intensive camp is designed for the fencer looking to improve their skills. Whether you’re a nationally-ranked competitor or just learning the ropes, our coaching staff will work to give you the tools you need to succeed at this challenging sport. This camp is suitable for all athletes, and coaches are welcome. Homestays may be available with a local family; please contact Darius (darius@researchtrianglefencing.com) if you need one. Jacek Huchwajda – Duke University Assistant Coach. Member of the German Olympic Team (1992 & 1996). Coached at FC Tauberbischofsheim, Oregon Fencing Alliance – Jacek’s students include Olympians, World Champions, and many national team members for both the USA and Germany. Darius Wei – Duke University Assistant Coach. Previously at Northwest Fencing Center in Portland, OR, Darius coached the US Division 1 National Team Champions in Men’s & Women’s Foil. Students who have worked with Darius include NCAA All-Americans, National Champions, and international team members. Facility: Our facility was designed from the ground up to be athlete-friendly. Sports tiles cushion your knees and provide similar traction to national championship pistes and visible repeaters allow you to train without looking back at the box. 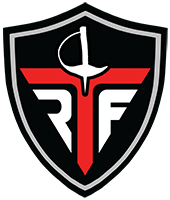 The small details of a well-designed facility are apparent at RTF – experience the difference! Full fencing attire, including underarm protector and knickers.